The Ekho E-15 heart rate monitor watch makes it easy and affordable to listen to your heart rate, letting you focus on your workouts instead. The E-15 reads your current, average, and maximum heart rate, but also offers a target zone alarm that lets you know whether you're working in, above, or below your target heart rate zone. As a result, you'll maximize your caloric burn and enjoy an efficient cardiovascular workout. Even better, the E-15 interfaces with the heart-rate-interactive equipment in most health clubs, helping you reach whole new levels of efficiency. 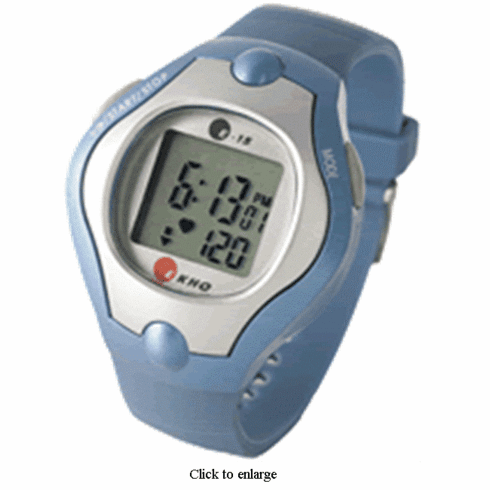 Other features include time and date functions, a stopwatch, an out-of-zone visual display, an audible "alarm off" mode, and an ultra-slim ergonomic chest belt transmitter. The water-resistant E-15 is ideal for walking, jogging, circuit training, swimming, and more and carries a five-year warranty.